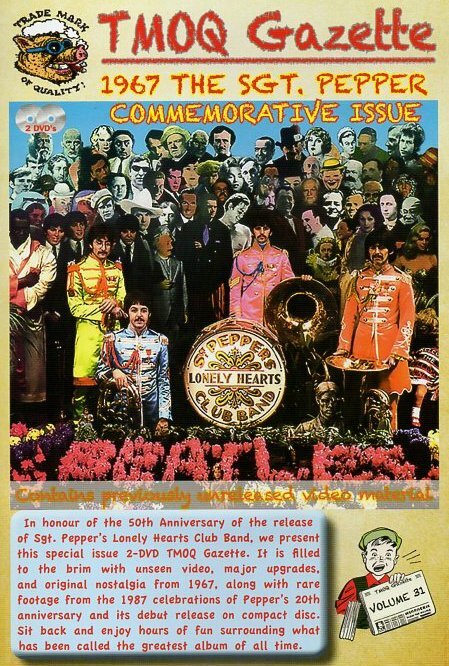 This 2-DVD issue is in honour of the 50th Anniversary of the release of Sgt. Pepper's Lonely Hearts Club Band. It is filled to the brim with unseen video, major upgrades and original nostalgia from 1967. Along with rare footage from the 1987 celebrations of Pepper's 20th anniversary and debut release on C.D. Hours of fun surrounding what has been called the greatest album of all time. 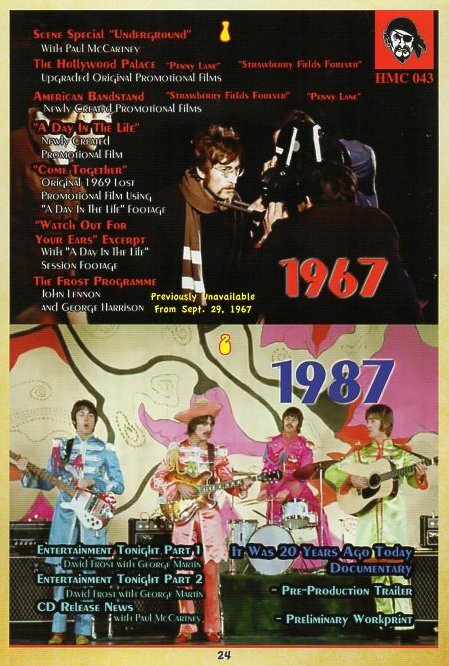 It also has an article on 1967 and Sgt. Pepper with full details of each film below. An interview with all four Beatles and Norrie Drummond of the NME (printed 27th May 1967). And all the usual HMC layout, pictures and design. Subtitled "It's So far Out It's Straight Down"
Directed by John Sheppard as a special edition of Granada TV's "Scene At 6:30". An examination of the emerging London underground psychedelic movement, that pre-dates San Francisco's "Summer Of Love" by six months. This complete 30-minute show features Paul discussing London's underground counter-culture, an interview conducted by producer Jo Durden-Smith on 18th January 1967 in a ground-floor studio at 3, Upper James Street, London. The editorial board of it (International Times). The Indica Bookshop and Gallery founder, Barry Miles. a rough version of "Matilda Mother", both at the UFO Club, 27th January 1967. A swinging London "happening" at Picadilly Circus with John "Hoppy" Hopkins. Each promo enthusiastically introduced by host Van Johnson. This sequence contains some incredible surprises ! Instead of another copy of the promos, these are versions that incorporate unseen outtakes ! In fact, Strawberry Fields is constructed entirely of outtake footage !! The Come Together audio is radically different from the released version !! The guitar is brought up front, and the keyboard is almost mixed right out ! of a concert at Kensington Olympia featuring Hendrix, The Who, The Animals, Pink Floyd and others. clips of other artists and the first public broadcast of the A Day In The Life promo and outtakes ! Previously unavailable, this features John and George - complete and uncirculated. Recorded before a studio audience in Studio One of Wembley Studios. A two-part U.S. TV retrospective over two nights. A two-hour documentary prepared by Granada TV in 1987 to examine the classic album. It also explored the summer of '67 and love and music changing the world. Featured in the film were: Paul, George, Derek Taylor, George Martin, Allen Ginsberg, Timothy Leary and many others. First (4) is a very rare pre-production industry trailer put together while still work in progress.